February Holiday Courses – Book Your Child’s Place Now! We are excited to welcome back the return of our Stanley Soccer Schools and our Activity Club for the February half term (18th February to 22nd February). Our unique holiday courses give children in the local area opportunities to learn and develop new skills in a safe environment. With the emphasis of each session to have as much fun possible! Our soccer schools’ programs have carefully put together course itineraries that cover a wide range of football related topics including, control, passing, dribbling, shooting, heading and all aspects of goalkeeping. Led by our team of coaches at the trust, players will be challenged and assessed to improve on their footballing abilities. Each session will include warm up activities, small sided games and finish with fun tournaments so that players can showcase their skills. Our Activity Club development team has carefully put together a jam packed itinerary that covers a wide range of different topics including, Arts and Crafts, Dance, Acting, Singing, Cinema Club, Multi-Sports, Games and much more. These allow children to develop, working individually or in pairs to develop and working in small groups to encourage skill acquisition and decision making. Every day, we have a different theme for example on a Friday we have a ‘Stanley Stars Talent Show’. Prices from £12 a day or £50 for the full week! Don’t forget we have an early drop available from 8.30am for no extra charge! 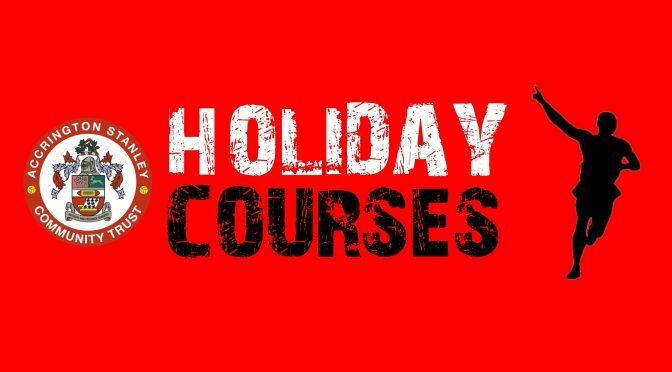 Our Holiday courses are available to book in advance at our website or call the office for more information on 01254 304071.